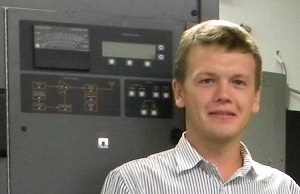 Dmitry Nazarenko, Engineer, TechWestService Ltd.
Dmitry Nazarenko, Engineer with TechWestService Ltd. on location. 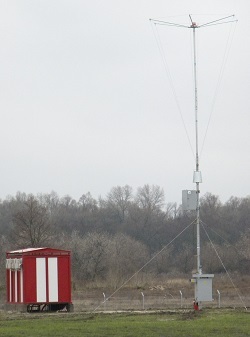 Uzhgorod site with CL40 antenna. Helipad near Kiev, Kanev site with CL-40 antenna. RPE TechWestService Ltd. has provided installation, technical support and maintenance services in Ukraine since 1997. We have huge experience in cooperation with the famous and best manufacturers of NAVAIDs in Europe. But we also like to introduce and support companies that are newcomers in our market. Some years ago attention was attracted by NDBs manufactured in Canada/USA. Due to specific frequency ranges, European NDBs did not meet the requirements of our customer. That’s why we started our study of world market. Now we can say that it was a good and very reasonable choice. During last year, our company, with Nautel’s remote support and assistance, supplied and installed nine NDBs around Ukraine. Six of them were installed at sites of Ukrainian Air Traffic Service Enterprise, one at “ANTONOV” plant testing aerodrome and two at helipads in Kiev and Kiev Region. The following information has been prepared and submitted by our Engineer, Dmitry Nazarenko, who touched every part of the equipment and performed all above mentioned installation activity around Ukraine with a very small but successful team of technicians. 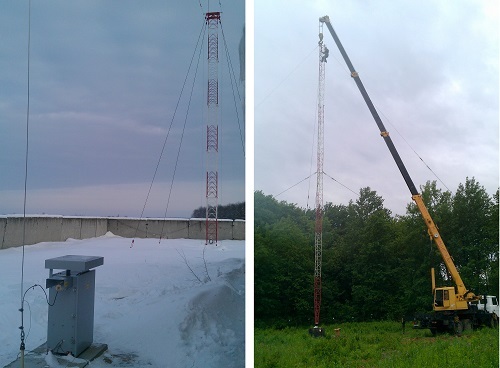 We would like to share our experience in installation of Nautel VR125/250 NDB equipment with different type of antennas in Ukraine. First of all, I want to thank Nautel for a very friendly and effective training course we attended at the beginning of our working relationship. Our training course was short and integrated into FAT of the equipment, but we had an excellent opportunity to ask questions, and get and even see answers. Moreover, because of local rules regarding reliability etc., the configuration of equipment at some sites required use of radio modems in order to provide remote control as a by-pass mode. Nautel prepared equipment configuration with radio modems, and during FAT we were able to test and finalize by-pass remote mode. 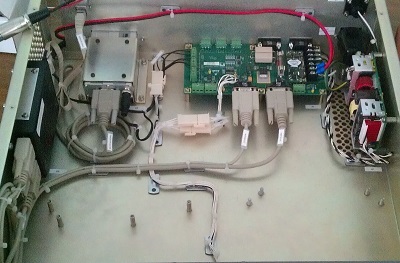 Left: modem location in rack. Right: modem location near VR-Link. The following photos illustrate comments regarding the equipment installation which arose from our particular environment and circumstances rather than from equipment characteristics. 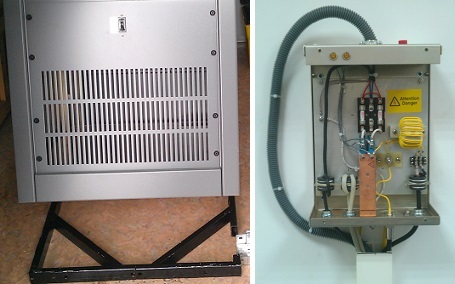 Left: metal frame was made to accommodate power supply connection and avoid installation of a false floor in the shelter. Right: wall mounting of SPU. Left: ANTONOV site where NDB VR-125 has T20 Antenna. 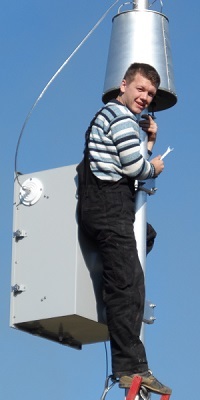 Masts were ordered locally in Kiev. 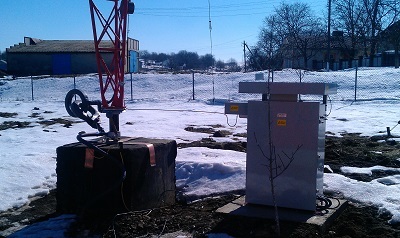 Right: Ivano-Frankovsk site where VR250 is equipped with 24 m TWR type antenna. One of the most interesting sites of VR125 installation was a helipad in the centre of Kiev. T20 Antenna masts are located on the concrete abutment; ground mat is installed at the foot of the abutment and covered by concrete (see photo below left). Because of masts (ordered locally in Kiev) bending after their installation we had reinforced them with guy ropes (see photo below right). The helipad is not in operation so far due to other uncompleted elements but the NDB has been tested and accepted according to the local rules. Left: Kiev helipad ground mat installation. Right: Kiev T20 antenna (ordered locally) reinforced with guy ropes. According to customer requirements (to have NDB status indication at work positions) we made an extension board for ECMP. And finally, due to lack of communication lines at Chernovtsy site required use audio signal from separate receiver (old “ Polet” radio station existed at site) adjusted to proper controller’s frequency. The only available line has been used for PTT. 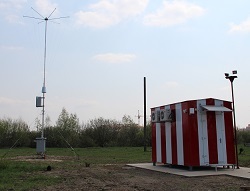 Chernovtsy site with TWR60 antenna. To summarize, we would like to confirm that all our customers highly evaluate the quality and reliability of Nautel NDB equipment. During the last Flight Inspection Test of the most problematic location of a VR125 which is near to Ukrainian border with Romania, and quite close to Romanian Musical Broadcast, the pilot of FIS laboratory aircraft said he wished that all NDBs worked like this one. So thank you very much for your good job and friendly attitude.